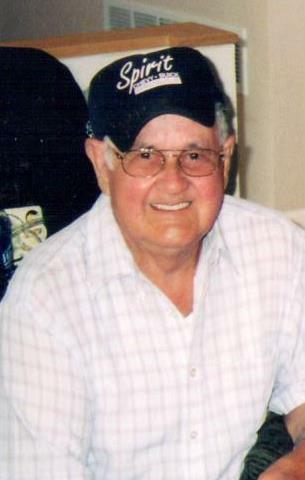 Lucian Ray Tillett, 94, of Stanford, KY passed away on Friday, November 23, 2018 at Stanford Care & Rehab in Stanford, KY. Born on May 16, 1924 to the late William Dilliard Tillett and Lillie Mae Cough Tillett. He was the widower of the late Margaret Ware Tillett, to whom he was married to for 65 years. He worked for 23 years at the Stanford Creamery and went on to retire after working 19 years at Whirlpool. Ray was a World War II veteran where he served in the United States Army from 1942 to 1946. Survivors include one son, Roger Ray Tillett (Billie Jean) of Lancaster, KY; one daughter, Donna Dean Singleton of Danville, KY; six grandchildren, Timothy Tillett, Tommy Tillett, Crystal Crouch, Will Singleton, Misti Davis, and Scott Carrier; fifteen great-grandchildren; and four great-great grandchildren. In addition to wife and parents, he was preceded in death by five brothers, Herbert Tillett, George Tillett, Charles Tillett, Shirley Tillett and Leroy Tillett; three sisters, Mayme Long, Ida Mae Martin and Ruth Von Linger; two infant brothers; and two grandsons, Bruce Harness and Troy Harness. Visitation will be Monday, November 26, 2018 from 5 to 8 p.m. at Spurlin Funeral Home in Stanford, KY. Funeral will be Tuesday, November 27, 2018 at 1 p.m. at Spurlin Funeral Home in Stanford, KY with Rev. Ernst Martin and Rev. Daryl Hodge officiating the service. Burial will follow at Buffalo Springs Cemetery in Stanford, KY with full military honors provided by Caswell Saufley Post 18. Pallbearers are Tommy Tillett, Tim Tillett, Will Singleton, Clay Crouch, John Davis and Ray Tillett. Honorary Pallbearers are Buddy Tillett, Claudis Tillett, Crystal Crouch, Rusty Banta and Phillip Tillett. The family would also like to give a very special thank you to Heritage Hospice for all the love and care they provided to Mr. Lucian Ray Tillett.